Ideally located on the edge of the roach of Anduze, the camping Gard, offers a range of Mobil-homes varied for your holidays with family or friends. In a wooded and preserved setting at the foot of the last foothills of the Cevennes, you will be awaiting rental accommodations adapted to your expectations: intimate Mobil-homes with 1 bedroom with extra bedding in the living room accommodating 3 to 4 persons, up to the big Mobil-Homes with 3 bedrooms for groups of 6 holidaymakers. In a couple with or without children, with a large family or with friends, your stay in the Gard looks restful and comfortable. 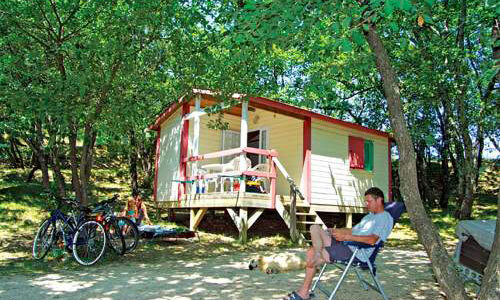 Several models of two-bedroom Mobil-homes can also be rented at the Domaine de Gaujac. With a surface of 24 m2, they offer are composed of a parent bedroom with double bed and a second bedroom with 2 to 3 single beds, side by side or bunk: different configurations, to offer you a tailored stay! At Domaine de Gaujac, many comfort services are designed to guarantee you a pleasant stay in the Gard. Each Mobil-Home has its own private terrace equipped with outdoor furniture, which allows you to take your meals in the open air in a green and relaxing setting. Indoors, you can enjoy a separate bathroom and toilet in the 2 to 3 bedroom Mobil-homes. In the rental stays, there is a comfortable sitting area and a kitchen perfectly equipped for your daily life. Simplicity and comfort are the key words of the Domaine de Gaujac: In a spacious and well equipped mobile home, your family stay in Anduze promises to be revitalising. Enjoy the pleasure of finding a warm and functional accommodation on your return trips to the Cevennes!